Romesco, Romesco. 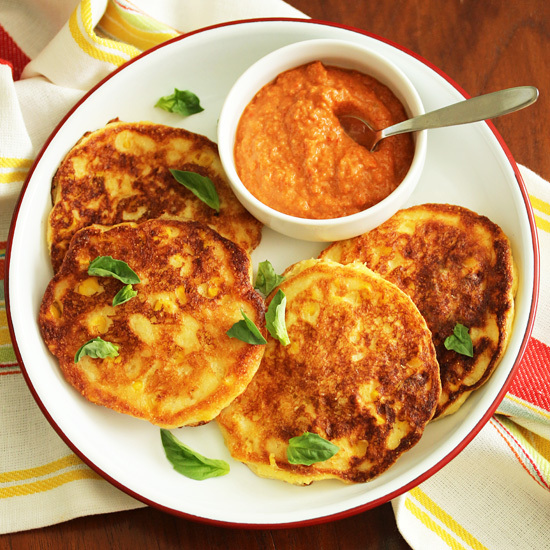 Wherefore art thou, Romesco? Ooops, I was getting a little silly there. I’m over it now. Continuing on…. Romesco sauce originated in Tarragona, Catalonia, in northeastern Spain. Fishermen made this sauce to eat with fish, but once made, it can be used in salads, with grilled veggies, meat, chicken, stirred into fish stews, tossed with pasta or as a sandwich spread. This mixture of almonds, garlic, red peppers, cayenne, balsamic vinegar and olive oil is your addictive multi-purpose helper. A little sweet, garlicky and vinegary, with perfect punch. I even used it on leftover pizza crust edges. You know how you eat a pizza, but leave those little curving edges because they’re pretty tasteless, empty carbs, and they fill you up? Well, I ate them for breakfast, spread with a little cold butter and for scooping up Romesco. Romesco with butter is divine. Maybe I could mix it in some melted butter and use that on garlic crostini or on fried eggs. Whoa, getting carried away here. One more thing about your Romesco, you can spoon about 2 tablespoons into each section of an ice cube tray, freeze for about an hour, then turn out into a zipclose bag and keep frozen for 3 months. Little flavor bombs, ready to go. Now, the corn pancakes. You probably noticed their yellow color, which is because they are made with yellow corn meal. And with high summer upon us, these are a perfect use for that sweet corn that is in every market. Or, you can do as I did, and use canned corn. Shame on me. But I wanted yellow corn kernels and my market only had white corn on the cob. About these corn pancakes…. if you don’t want to make Romesco, an alternative is to make a nice herb butter with minced cilantro, parsley and basil. Add them to some softened butter, roll in a log, chill, and slice coins to place on top of your hot pancakes. I’m shaking my head up and down. That sounds really good, especially if you’re using the pancakes as a corn side dish, along with your meat or fish. Actually, I bet they would taste good with maple syrup, too. Just sayin’. 1. Preheat oven 350 degrees F. Place almonds in medium bowl and cover with boiling water. Let sit for 5 minutes, drain and slip off skins. Skip this step if using blanched or sliced almonds. 2. Place almonds on baking sheet and roast in oven for 7-8 minutes until golden. Set aside. 3. Turn oven up to 400F. Cover baking sheet with aluminum foil. Cut red peppers into quarters, remove seeds and place on baking sheet. Roast in oven for 40 minutes, turning them over half way through, until some edges are black. 4. Remove red peppers from oven and fold aluminum foil up and around them. Twist foil together and steam peppers for about 10 minutes. Open foil and remove skins from peppers. 5. Place garlic slices and almonds in small food processor and whiz until finely minced. Add peppers and process until smooth. 6. Add cayenne, salt and vinegar and whiz until well mixed. Add oil and process until quite smooth. Spoon Romesco into serving bowl. Note: Romesco keeps in the refrigerator for at least a week. 1. In a large bowl, whisk together the cornmeal, flour, baking powder, soda and salt. 2. In a medium bowl, whisk the egg until frothy. Add the yogurt and oil, and whisk to combine. 3. Add yogurt mixture to flour mixture and stir with a fork to combine. Stir in the corn kernels and basil. 4. Drizzle canola oil to cover bottom of large skillet. Heat over medium-high until oil is hot and shimmering. 5. Use a ¼-cup measure to scoop batter into pan, patting batter to flatten to about 3/4-inch thick, leaving ½ inch between pancakes. 6. Reduce heat to medium-low and cook until pancakes are deep golden brown and edges are dry. Turn with a metal spatula and cook second side. 7. Transfer to oven-safe plate lined with paper towels and keep warm in a 200F oven. 8. Sprinkle with a very light dusting of kosher salt and serve with Romesco sauce. Garnish with chopped basil, if desired. I love Romesco on everything! 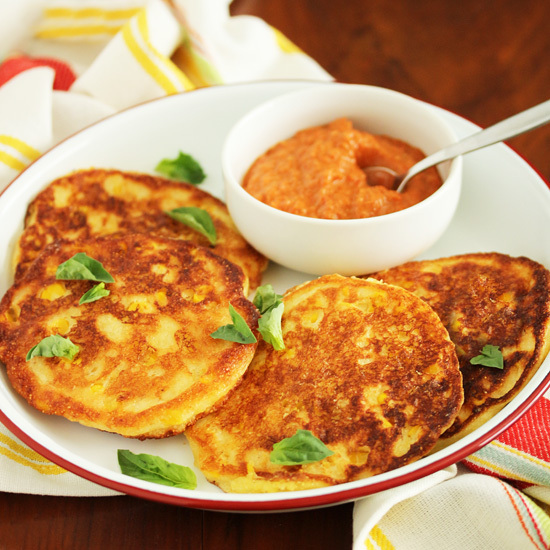 I haven’t made corn pancakes before and they sound like the perfect pairing with the sauce. Great idea to freeze it in an ice cup tray.